Pick up at 08:30am from your hotel for the a day tour of old Istanbul city. Visit to ST. SOPHIA This ancient basilica, built by Constantine the Great in the 4th century and reconstructed by Justinian in the 6th century, is one of the architectural marvels of all time. Lunch break at the Turkish restaurant. SULTANAHMET IMPERIAL MOSQUE Across from St. Sophia built in the 16th century by the architect Mehmet, is known as the BLUE MOSQUE because of its magnificent interior decoration of blue Iznik tiles. HIPPODROME Ancient Hippodrome, the scene of chariot races, with the three monuments; the Obelisk of Theodosius, the bronze Serpentine Column and the Column of Constantine. Lunch break at 13:00pm after the lunch Murtis Tour will then take you to the Bosphorus Cruise tour. Enjoy the array of sites you can see from the boat including: SPICE BAZAAR (Egyptian Bazaar). BOSPHORUS BY BOAT a traditional excursion by boat along the waterway separating Europe and Asia. Overnight in Istanbul. After breakfast visit to TOPKAPI PALACE The great palace of the Ottoman sultans from the 15th to the 19th centuries housing an exquisite collection of cyrstal, silver, and Chinese porcelain, robes worn by the sultans and their families, the famous jewels of the Imperial Treasury, miniatures, the Holy Mantle; enshrining relics of the Prophet Mohammed. After the lunch depart for Istanbul Ataturk airport for domestic flight to Cappadocia. Transfer from airport and check in to your hotel in Cappadocia. Overnight in Cappadocia. Today we will get to know the Cappadocia region, a volcanic area in which the geological formation started 10 million years ago. As a result of these formations phallic like pillars have come to life. The beautiful horse country Katpatuka, (as the Persians called her) is an unbelievable strip of land, enchanting and mysterious. Cappadocia region is also famous for its arts, including ceramic and carpets. You will be picked up approximatley 09:30 from your hotel to join our regular tour. Tour starts with Uchisar Castle, the highest point of Cappadocia. 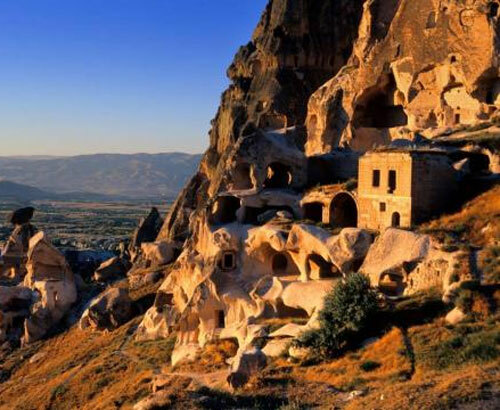 After Uchisar, you visit Goreme Open Air Museum, the Heart of Cappadocia. Goreme Open Air Museum is famous for frescoes dating to 10th century describing the life of Jesus Christ and monks. Next stop is Cavusin, which is an abandoned village with old cave Greek houses. After Cavusin you go to the restaurant in Avanos to have lunch. After lunch, you visit a pottery work shop, to see how to make potteries. Then you go Pasabagi where you can see three - headed fairy chimneys. After Pasabagi you visit another workshop to see Cappadocian handwoven carpets and kilims. Next stop is Devrent Valley, which is also called Imagination Valley, where you can see natural rock formations looking like animals. Then you head to a wineshop in Urgup for wine tasting. Last stop is Three Beauties, three beautiful fairy chimneys with their hats, which is the symbol of Cappadocia. This tour will end approximately 18:00 and you will be returned back to your hotel. Overnight in Cappadocia. After breakfast you will have free time shopping in Cappadocia. Today we depart for Kayseri airport for our domestic flight to Istanbul and then back to home. We hope your tour was a memorable one and we would like to see you in the future in one of our tours again. Have a nice trip back home and thanks for choosing Flag.